It isn’t Chicago history without a dose of mafia intrigue — and some killer blues tunes, too. This lively and fascinating private tour sends you back to the Chicago of the 1920s, 1930s, and 1940s, when Prohibition was in effect, when Al Capone roamed the streets, and when live music had never been hotter. See the site of the St. Valentine’s Day Massacre, visit a legendary bar, take in some performances and otherwise immerse yourself in the Windy City’s edgy past. After dark is the perfect time to discover into Chicago’s notorious past. This private, 2.5-hour tour kicks off between 7:30pm-8pm (depending on the season). 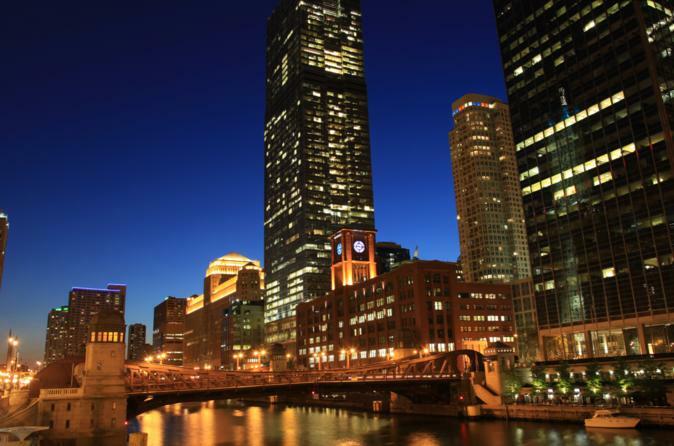 Your guide will meet you directly at your downtown Chicago accommodation, where you’ll be picked up and transported around town in a comfortable, private vehicle. As you go, you’ll travel back in time — metaphorically, at least — to the Chicago of the 1920s, 30s, and 40s. The first stop that you’ll visit on this evening outing is the Lincoln Park location of the 1929 St. Valentine’s Day Massacre, an infamous episode from Chicago’s Prohibition past. Your guide will give you historical context for the event, and will also explain how blues music was in fact used as a powerful tool to help the mafia grow in Chicago. Next, you’ll continue through the North Side, and will explore the nightlife that makes the area famous. Stop by a legendary bar formerly owned by mobster Al Capone. Purchase a drink, if you wish, and listen to some jazzy live music. The night winds down with a short sightseeing drive, which will give you some of the best angles on Chicago’s iconic skyline. After that, you’ll be returned directly to your Chicago accommodation. Tour attendees must be aged 21 or over; please bring a government-issued photo ID on the tour with you.